The Superman Fan Podcast: Episode #313: Superman Comic Book Cover Dated September 1963: Action Comics #304! Episode #313: Superman Comic Book Cover Dated September 1963: Action Comics #304! ACTION COMICS 304, September 1963, was published around July 25, 1963. It contained 32 pages for the cover price of 12¢. Mort Weisinger was the editor, and the cover was pencilled by Curt Swan and inked by Sheldon Moldoff. It featured the Superman story in this issue. 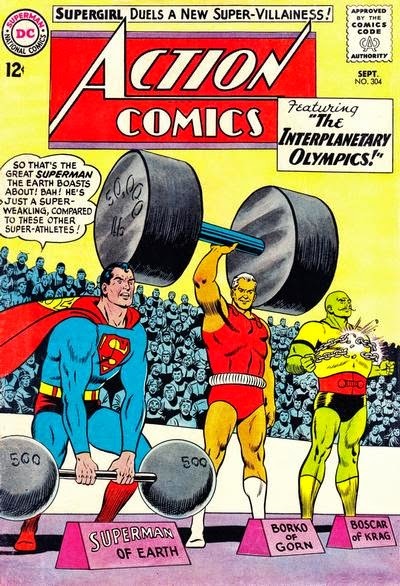 - Superman starred in the 12 page story titled, THE INTERPLANETARY OLYMPICS, written by Leo Dorfman, pencilled by Curt Swan and inked by George Klein. It was reprinted in SHOWCASE PRESENTS: SUPERMAN vol. IV. - Supergirl fought THE MAID OF MENACE. This 13 page story was written by Leo Dorfman and drawn by Jim Mooney. This story was reprinted in SHOWCASE PRESENTS: SUPERGIRL vol. II. Also highlighted in this episodes are the issue's ads and other features, including the METROPOLIS MAILBAG letter page. Elsewhere in DC Comics, 28 titles carried the September or September/October 1963 cover date, according to Mike's Amazing World Of DC Comics. Next Episode: SUPERMAN FAMILY COMIC BOOK COVER DATED NOVEMBER 1960 PART I: WORLD'S FINEST COMICS 113! In 2 Weeks: SUPERMAN FAMILY COMIC BOOK COVER DATED NOVEMBER 1960 PART II: SUPERMAN'S GIRL FRIEND LOIS LANE 21! In 3 Weeks: SUPERMAN COMIC BOOK COVER DATED OCTOBER 1963 PART I: SUPERMAN 164! In 1 Month: SUPERMAN COMIC BOOK COVER DATED OCTOBER 1963 PART II: ACTION COMICS 305!